Prof. Melody Baglione (Mechanical Engineering) and graduate student Michael Pimpinella are co-authors of a publication titled "Mobile Digital Recording: Adequacy of the iRig™ and iOS device for Acoustic and Perceptual Analysis of Normal Voice" in the Journal of Voice, Vol. 31, Issue 2, 236-242. Objective: The purpose of this study is to determine whether the iRig™ and iOS device recording system is comparable to a standard computer recording system for digital recording of normal voices. Methods: 37 vocally healthy adults, aged between 20 and 62 years, mean age of 33.9 years, 13 males and 24 females, participated in the study. Eighteen subjects were recorded with the iPhone and 19 with the iPad. Recordings were simultaneously digitalized in an iPad and iPhone using a unidirectional condenser microphone for smartphones and tablets (iRig™ Mic, IK Multimedia) and in a computer laptop (Dell-Inspiron) using a unidirectional condenser microphone (Samson-CL5) connected to a preamplifier with phantom power. Both microphones were placed on stands and lined up at an equal fixed distance of 30 cm from the subject’s mouth. Speech tasks consisted of a sustained vowel “ah” at comfortable pitch and loudness, counting from 1-10, and a glissando “ah” from a low to a high note. The samples captured on the iOS devices were transferred via SoundCloud in a wav format. Samples from both devices were analyzed using the Praat software. The acoustic parameters measured were mean, min and max F0, SD F0, jitter local, jitter rap, jitter ppq5, jitter ddp, shimmer local, shimmer local-dB, shimmer apq3, shimmer apq5, shimmer apq11, shimmer dda, NHR and HNR. Results: There were no statistically significant differences for any parameter and speech task analyzed for both the iPad and iPhone results as compared to the measures obtain by the gold standard computer/preamp system (all p values>0.050). In addition, there were no statistical differences in the perceptual identification of the recordings among the different devices (p<0.001). 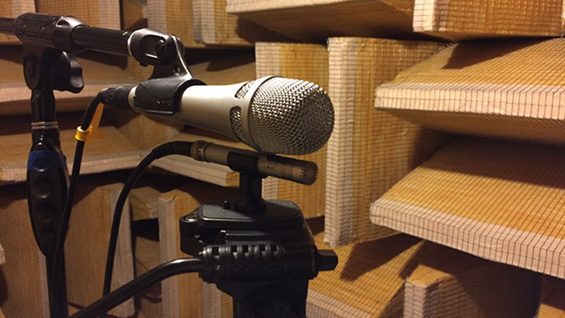 Conclusion: In this study, the iRig™ and iOS device can possibly provide reliable digital recording of normal voices.